Animal Defenders International : Animal experiments : Cruelty-free cosmetics legislation in North America - California takes a huge leap! Cruelty-free cosmetics legislation in North America - California takes a huge leap! ADI supports pending legislation in the US and Canada to end animal testing for cosmetics and the sale of animal-tested products. California, the first US state to ban the use of animals in cosmetics testing, made history again in September 2018 by passing the Cruelty-Free Cosmetics Act (SB 1249), which makes it unlawful for a manufacturer to import or sell any cosmetic product or any of its ingredients if they were tested on animals on or after January 1, 2020. Canada’s Cruelty-Free Cosmetics Act (S-214) passed the Senate on June 19, 2018, and moved to the House of Commons. S-214 is sponsored by Senator Carolyn Stewart Olsen and mirrors the similar EU ban, which has worked successfully and influenced change around the world. If you live in Canada, ask your MP to support Canada’s Cruelty-Free Cosmetics Act. Find your MP here. 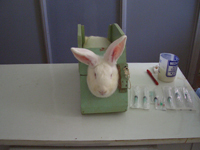 “The cruelty-free cosmetics act is a response to the desire of many Canadians to end a practice they find disturbing. Canadian society has moved beyond accepting as a given the necessity of torturing animals for beauty products.” Canada Senator Carolyn Stewart Olsen. Repeat dose toxicity: a product may be pumped down an animal’s throat or applied to its skin, or the animal might be forced to inhale it, to observe chronic, long-term effects on organs. Skin sensitization: may involve abrading the skin and deliberately causing painful damage to assess potential allergic reactions to substances with contact. Carcinogenicity: animals are exposed and monitored for cell changes which could lead to the development of cancer during or after exposure. Reproductive toxicity: animals are exposed to substances before and/or during pregnancy to test for poisonous effects, including its ability to reproduce, as well as damage to the fetus or its development. The tide is turning; a (2015 Gallup poll) revealed more than two-thirds in the US are “concerned” or “very concerned” about animals suffering in research, with a third saying animals should have the same rights as humans. A 2015 Nielson poll found most consumers considered “not tested on animals” as the most important packaging claim, with 43% willing to pay more for such products. At least 140 personal care products companies have endorsed the Act. People around the world are turning their backs on these outdated methods. ADI worked for decades with NAVS on the 2013 EU ban; the EU Parliament recently called for a worldwide ban on animal testing for cosmetics. We endorse their call for global change; we support the US Humane Cosmetics Act and Canada’s Cruelty-Free Cosmetics Act as well, and urge your support to bring these nations in line with public opinion and nearly 40 countries who’ve banned cruel and needless testing (including Austria, Belgium, Bulgaria, Croatia, Cyprus, Czech Republic, Denmark, Estonia, Finland, France, Germany, Greece, Hungary, India, Ireland, Israel, Italy, Latvia, Lithuania, Luxembourg, Malta, Netherlands, New Zealand, Poland, Portugal, Romania, Slovakia, Slovenia, Spain, Sweden, UK). As it stands, cosmetics companies must meet cruelty-free requirements for the 1.5 billion consumers in the global marketplace. Hundreds of cruelty-free cosmetic companies now thrive in North America, and the market increasingly demands humane products. In the US, please contact your Member of Congress today to support the Humane Cosmetics Act (HR2790). In Canada, please contact your Member of Parliament today to support the Cruelty-Free Cosmetics Act. (S-214). We have provided a US template letter and a Canadian template letter to assist you.